Cheers Hazelnut, Will and Cal, it was tempting to go out again in the rain this afternoon as it's so long since I had a summer run in the rain but the last 18 months have taught me to tread carefully when coming back from injury! Next run will be at the weekend. Cracking race report about a substantial ultra bagged, Hazel. Excellent racing. UTMB in the future? Glad your back's improved enough to let you run pain free, Nessie. Pompey Matt, you must have large reserves of patience - hope your recovery gathers pace. A searching session, Cal - you rarely ley up on yourself. Me: 0730 Sought out grass and trail to cut down the protests from my L knee. Soft, refreshing rain, a shy Westie and a white-faced sheepdog made the miles pass quickly. Up early and out on the lake trail again for 7 miles this morning. With no rest day, my legs felt it today, especially my quads on the inclines. Last 2 miles home were a real effort, but surprisingly had a slightly faster pace than yesterday overall. Needed a good sit down when I got home and my wife reminded me that I am no longer 'young'. The cheek of it. Looked back at my year on the Tom Tom and found I've done 670 miles. If you'd told me that 2 years ago I would have laughed. Spot of the run was a glorious Green Woodpecker feasting on an ants' nest. Did a couple of miles incline run on the gym treadmill yesterday. Today just over 7.6miles at about 7:30m/m pace. Weather does not know what it wants to do. Very sweaty. Cut through a new estate for the first time. A friend of a friend has moved there. She just got her divorce settlement and bought a Labrador puppy. Reasonable exchange. Nice spot, Will. I've seen green woodpeckers a couple of times on the common but usually I just hear them. I haven't heard them for a while, though - I do hope the local parakeet population hasn't displaced them. JT, I don't know how you manage that. I find it really hard to run on treadmills without losing my balance. I am dyspraxic, though, so there's that. I did 6 very easy miles today, enjoying the nice but not too warm weather. If the entire summer was like this, I'd be happy. I just hate it when it's hot. I decided, rather last minute, to run Battersea 10K tomorrow. My local parkrun has been cancelled due to a folk festival and most of the others are a bit of a faff to get to (unless you have a car or bike, which I don't) so the 10K seemed like a better option. I'm not in 10K shape, so a PB is very unlikely, but I'll be happy if I can finish somewhere around the 55 mark. Good mileage for the year will and nice run. If your wife gets too cheeky you should maybe exchange her for a labrador puppy as well - it could go with you on runs and wouldn't make cheeky comments when you get back from one without it. Have a good 10k tomorrow Cal. Could you send some of that not too hot weather my way? We are back to 30+ again but it is supposed to be better as of Sunday. Went out this morning at 07:30 after a nice cup of tea and a banana for a relaxed 10km in around 59 mins. It was like running wrapped in a warm, damp blanket. My left leg feels pretty recovered from last weekend's efforts, the right one is slightly grumbly still. Wildlife spotting - a hare - impressive sprinting capabilities. Tried out a new bit of kit I got at last week's expo - a FlipBelt, basically a wide stretchy fabric belt with holes into which you can put various items such as keys, phone, small food items, money etc and a 300ml water bottle. I hate bottle belts as they slip and jump around and end up around my ribcage. This seems to stay put. 300ml isn't much but better than nothing. Getting the bottle in and out of the belt means a short walking break but I can live with that. Will do a 10 miler to a HM on Sunday at relaxed pace then dive into a training plan for Frankfurt Mara as of next week. Need to decide which one - have 12 weeks rather than 16 to work on speed over longer distances. 10K was OK but not great. I ran it in 55:48 which is two minutes slower than the same race in January. I was aiming to run it at HM pace but only managed that for a mile and then started to slow. Legs had nothing more to give. I don't think this year's Autumn HMs will be as strong as last, somehow. 13 miles easy today. Didn't feel too bad considering I ran a 10K yesterday. As I pulled up I saw a young dad jogging with his toddler on his shoulders. "That looks hard," I said. He agreed. But fair play to him. 8.7miles in under 1hr7. Pretty comfortable. Lot of people about. There had been a 10k Run For Life this morning so still some milling about from that. The next 10 days are not my own so will have to fit in runs (escape) as and when. Good luck with that, JT. An easy 5 miles to start the week. Legs felt OK but I was pretty fatigued overall. I did 40 miles last week which is my highest mileage since Manchester, so not surprised, really. Well done on your 10k Cal. Good mileage for the week. Hope you can enjoy the escape sessions in the next few days JT. 18km for me yesterday in 1:43:30. Mildly undulating course around the local fields and woods. Need to work on my pace control for flatter running as my splits were pretty inconsistent on the non-undulating bits. Cooler conditions than recent weeks with a brisk breeze although when the sun came out I suffered instant hot. Very few people around for a Sunday afternoon - just a couple of families out cycling. I've been rather undercover- super busy ATM. Mum and stepdad moved into the granny flat finally on the weekend. It's just as well I'm off work as I can't remember being this busy in recent years.. I must be tired, Nessie, as I read that you'd been a super busy undercover cashpoint machine. I felt crap yesterday (tired, listeless, cranky knee) so took the hint and made it a rest day. Did a sort of progression run today, but didn't quite manage to keep the progression into the last mile, which was 2 second slower than the one before. I was breathing hard, too. I think I'm just tired and will need to taper aggressively before Maidenhead. It isn't my target race but I'd still like to do a sub-2 - however, not sure it's possible based on my recent form. I couldn't manage sub-2 pace for a 10K, so a half marathon seems a bit of a stretch at this point. Thanks for the messages, it's been a long road to recovery and the mental side of things was quite a battle at times but currently I'm incredibly positive! I did my equivalent of an LSR on Sunday of seven miles which was tough but not too bad and yesterday had rather an odd run of five miles. I initially went out at a fairly quick pace for the first 5k but then deliberately slowed down considerably for the remainder although when I got home and checked the time it was my fastest five mile run since January of 2016 which seemed hard to believe as it really hadn't seemed anywhere near that fast, plus it was a completely regressive run in that the pace slowed with each mile! Will get out for a 5k tomorrow probably but I want to be careful not to push too hard or too far until I'm ready for it, after so long on the sidelines I don't want to get injured again! Don't stress yourself too much with your times Cal. If I remember you have 4 HMs coming up so target on the later ones for PB attempts. Well done for getting out for your runs Nessie. 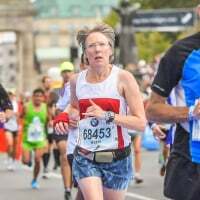 I started my autumn marathon training this week (Frankfurt on 29.10). This week is not too heavy which is good as I am theoretically still recovering from my 47km. Did some core work on Monday and was rewarded with a set of achy hamstrings on both legs. I took it gently on my usual Tuesday evening outing and plodded around with two of the slower members. We had a nice chat about DNFing - which happened to both of them in a mountain race last weekend - they were understandably a bit disappointed but are both very experienced runners and know when to bail out. Got absolutely soaked yesterday for the first time in a long time on a 10km outing. Had planned to muck around with the pace a bit - the plan was to do 2.5km sections at different paces. The heavens opened at around 5.5km so the remaining 4,5 almost turned into a tempo run as I started to get cold due to the wind gusts. Another runner came in the opposite direction looking equally soggy. London didn't look much fun yesterday evening. Been watching quite a bit this week. So, most of us are keeping pretty busy in spite of the holiday season - such a variety of distances, terrain and purposes. Truly, running allows for broad differentiation. Cal, L knee here is making an exhibition of itself, restricting distances. Feels like shin splints, easily fixed of course unless the drongo who owns it runs every day! Glorious seaside conditions today, dogs ranging from friendly to 'Death Wish' and 45 minutes of trail, beach & path, with one comedy spreadeagle fall onto grass. No-one saw and I stopped my watch before I hit the ground. Sensible, PM, very sensible - I'm sure your plans will pay off. Hazel, full marks for forward planning. I wonder what runners talk about when out together or in a group? I've run solo for 4 years and I don't think I miss convo. Will, I almost don't envy you holidaying in that heat. It's been pleasantly stuck around 20-22 degrees here. Perfect. Hazelnut, it absolutely chucked it down here on Wednesday. I was glad I got my run in before the heavens opened. It was almost Biblical. swittle, your run descriptions always make me smile. Good job you fell on grass, eh? Also, I can't understand how people can chat while they run. I always find it hard to talk when running, even at an easy pace. I'd rather save my lungs for breathing. Just yoga yesterday, and 6 easy today. Hazelnut, love your commitment - always inspiring, especially when I think of the 'hill's you run up. Moved on to Dubrovnik today. Still very hot and very very busy. Nice old town and all that but swarming with hot and bothered people. However, I have managed a run! Needed to get my legs moving and test the conditions, so did a very sweaty 2.5 miles up and down our bus route and enjoyed it a lot. It was dusk but still 31C so I didn't want to push my luck and dehydrate too much. Will probs extend it tomorrow evening...unless I'm eating goulash and gelato again. I peed down the walls of Dubrovnik when I was 6. I was on a tour with my parents and couldn't wait, so my dad held me out while I did what I needed to. That aside, I have nice memories of the holiday there, even though it was a long, long time ago now. (It was Yugoslavia back then, of course - and it wasn't King's Landing back then either so I'd imagine there are a lot more tourists now). My usual unbrilliant parkrun today - 27:35 or thereabouts (had to stand at the start for a while as it's crowded, and the first corner was very slow). Very warm and muggy too. I averaged HM pace, which felt quite tough. It seems a long time ago that I could bang out sub 8:30 miles. Will, I support your robust approach to pre-event fuelling! Heat needs a careful approach. Cal: doing what needs to be done is rarely wrong! Have you a less rammed parkrun nearby? Have been out to eat a lot the last few days, and finishing off everyone's left overs (I resent leaving paid for food on the plate). Feel fat. Nevertheless, a quick 6.2miles in 44mins yesterday evening. Bunch of people doing sprints on a nearby long bridge that straddles the rail lines. Aerobic gym session today including a run on the treadmill - 12min at incline, 8min at pace. Nextdoors cat is gradually moving itself in to our house - the neighbour's away a lot. It's asleep on a cushion behind me and I've started buying cat food. I'm not sure why. swittle - problem with south London is that it's easy to go north, but a pain in the bum to go east or west. I don't have a car or bike (actually I can't even ride a bike - as a kid I was what is now termed dyspraxic so I never learned) so the next nearest is a 45 minute jog, and thereafter it's a walk, train journey (with a change) and then another walk for most of the others. The easiest would be Finsbury Park which is in north London and that'd be a half hour tube journey with a change, but the park is near the station. When I've got a parkrun 10 minutes up the road, I just can't be arsed. However, my club is trying to get one going on Clapham Common, which is a mile or so away, so if that bears fruit I'll be trying it out for sure. One the plus side, I discovered I was first in my age category today, so that cheered me up slightly. JT - I took a dump in the Great Gateway of Rhodes when I was 5 - hope you didn't step in it. This should be a new feature - iconic places MLRs have crapped or pissed on. Albeit mainly Cal. Plenty of places as a child...Yorkshire moors, a wadi in Tunisia...and the unfortunate time I vomited on a bus following Star Wars, where I'd had too much Kia Ora and then got motion sickness during the Death Star bombing sequence. Fortunately I've been continent as an adult. No Paula-type problems on runs or anything. Beautiful day today, so despite only having 5 hours sleep after the excitement of last night's athletics (poor Bolt - bet he wishes he'd retired after Rio now) which left me too wired to go to sleep at the usual time, I dragged myself out for a 15 mile run at 6:30am. Nice and fresh, as predicted, with a perfect blue sky. The lowness of the sun did mess with me a bit, as the confusing chiaroscuro resulted in a few odd steps due to the ground being higher or lower than I expected. Dropped a big F bomb the last time this happened, right in front of a bunch of dog walkers. Oh well. I felt pretty tired and heavy legged at the start and didn't really feel good until I got to 12 miles. I opted to gun my last mile, simply because I was curious as to what I had left in the tank, and did that in under 9:30. Most of the miles were in the 10:30s or 10:40s with a couple of 11s where the ground underfoot got a bit rooty. Not keen to turn my ankle with four HMs approaching. Great effort there, Cal. I'm sure your preparation will pay off in your HMs. I have managed to stay more or less continent here in Dubrovnik, although I did slip in what appeared to be an old puddle of pee at the foot of the old walls this morning! I think there may have been an accident had I gone up in the cable car with the rest of my gang earlier, but I stayed on terra firma and watched some lovely Alpine Swifts. Ate more modestly today, ie fuelled up extensively on protein-rich local cheese and cured sausage. So managed to get out for a pleasant and smooth feeling run amidst the sound of cicadas and the smells of olive trees, lavender and huge pizzas. Just over 3 miles in just over half an hour - my Croatian homage to Mo. Hmm - not sure that Hunstanton (the scene of quite a few childhood holidays) counts as iconic. Regarding chatting out running - I work from home and my Tuesday outing is a good opportunity for some socializing. Regular topics of conversation are - well - running, cows (two dairy farmers in the group), food (also two chefs), children (can't add to that one - not having any..), errm - sometimes politics - I run off when they start on that. I like it when it suddenly goes quiet when the hilly bits start. Will - I have not long eaten lunch but I'm hungry again now after reading that. Went to the in-laws for the weekend so had to do my long run on Saturday rather than Sunday. 20km in 1:46:30. Put in a few faster kilometres - the legs are starting to get used to the idea of going faster again after weeks of steady plodding up and down hills. Will, sounds wonderful. Watch out for mozzies though! I remember my dad got bitten to hell and puffed up like a monster. Mum and I got bitten too but not nearly as dad. Guess Dad tasted better. Hazelnut, good run. I'm trying to persuade my legs to go faster, too. I did 7 miles with a 3 mile tempo in the middle at HM pace. The middle mile of this was slightly outside 2 hour pace but it was uphill (not a hill in your terms, Hazel...more of a slope...but it makes a difference) but the last fast mile was on target, so I'm happy with that. Still, I'm not on for a sub-2 at Maidenhead based on my recent 10K time, unless I can work miracles between now and then. It's not my target race, though, so if it happens, it happens, and if it doesn't, never mind, I'll have three more chances to do better.